Drawing Ink on 100% Acid Free Reg Paper | 5" x 5"
Painting Acrylic on Canvas | 9" x 30"
Painting Pen and Ink on Canvas | 24" x 24"
Varsha Kharatmal, 33, is a trained artist, and has held art shows across India. She's also hearing impaired... Varsha Kharatmal's happy, beaming smile bespeaks her bubbling enthusiam and exuberance for life. But that isn't all that makes Varsha special. A painter of extraordinary sensitivity and skill, Varsha was born deaf. Her art speaks for her, expressing all that she cannot say in words. Varsha's father, an art teacher, was the first to recognise the flowering of her artistic genius. Chosen by her father to carry on his legacy in art, Varsha grew up with paintings, photography and calligraphy. She says her decision to be a painter was not so much a defining moment as the inclination of a lifetime coming to its natural fruition. But her journey had its difficulties. After school, Varsha had to take the sudden leap from a school for hearing-impaired students to a regular Art College. The talented artist, unable to hear theoretical lectures, had to rely solely on textbooks and notes to get her through college. Although she didn't fare as well with theory, she was acknowledged as the best in drawing among the female students: a fact that brought her together with her husband-to-be, Ramchandra Kharatmal, the best in class among the male students. Getting to know Varsha wasn't as easy as it might have been had Varsha been a girl like any other. Ram speaks of how he gradually picked up sign language to communicate with his talented colleague. 'When we hear words, it helps us to think about them before we respond. She, on the other hand, doesn't have as much time to process her thoughts. She also has trouble grasping the meanings of many words,' explains Ram. Varsha isn't one to be held back by her disability. A beautifully clean home, a well-cared-for, bouncing twoyear-old boy, and a series of paintings whose subjects seems to leap out of the canvas, are the outward signs of a woman who takes life's slings and arrows in her stride. She meets questions on her disability with a shrug. For Varsha, it's just one of those things. Varsha's made her peace with the hand fate has dealt her, and contentment lies at the heart of her dimpled smile A supportive family and an understanding husband have allowed her the freedom to live her dream, and Varsha delights in her life and appreciates all that destiny has given her. When her husband and fellow-painter brought home the works of the great artist A A Almelkar for a work assignment, Varsha found her rolemodel. Following in the same style of decorative painting, Varsha struck out on her own. Her technique is as fascinating as her paintings. The basis of each Ajantaesque painting is a bold black line, flowing fluid and unbroken through the painting. Fusing realism with the miniature style, Varsha's works are a cornucopia of colour and rich, gorgeous detail. Among her many successful experiments with the style is her latest innovation: adding the signature motifs that border nearly all Indian miniatures to a large canvas. 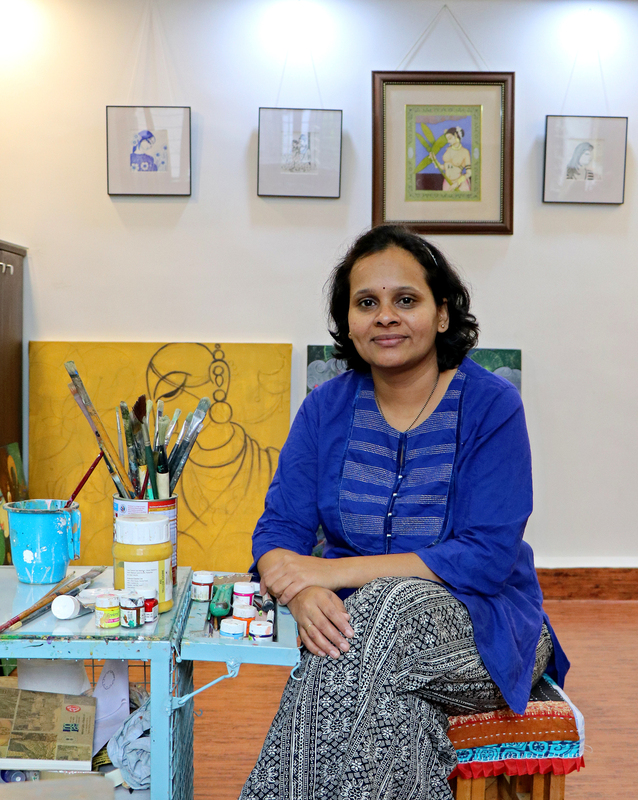 Varsha Kharatmal, 33, is a trained artist, and has held art shows across India. She's also hearing impaired...Varsha Kharatmal's happy, beaming smile bespeaks her bubbling enthusiasm and exuberance for life. But that isn't all that makes Varsha special. A painter of extraordinary sensitivity and skill, Varsha was born deaf. Her art speaks for her, expressing all that she cannot say in words.Varsha's father, an art teacher, was the first to recognize the flowering of her artistic genius. Chosen by her father to carry on his legacy in art, Varsha grew up with paintings, photography and calligraphy. She says her decision to be a painter was not so much a defining moment as the inclination of a lifetime coming to its natural fruition. But her journey had its difficulties. After school, Varsha had to take the sudden leap from a school for hearing-impaired students to a regular Art College. The talented artist, unable to hear theoretical lectures, had to rely solely on textbooks and notes to get her through college.Although she didn't fare as well with theory, she was acknowledged as the best in drawing among the female students: a fact that brought her together with her husband-to-be, Ramchandra Kharatmal, the best in class among the male students. Getting to know Varsha wasn't as easy as it might have been had Varsha been a girl like any other. Ram speaks of how he gradually picked up sign language to communicate with his talented colleague. 'When we hear words, it helps us to think about them before we respond. She, on the other hand, doesn't have as much time to process her thoughts. She also has trouble grasping the meanings of many words,' explains Ram.Varsha isn't one to be held back by her disability. A beautifully clean home, a well-cared-for, bouncing two year-old boy, and a series of paintings whose subjects seems to leap out of the canvas, are the outward signs of a woman who takes life's slings and arrows in her stride. She meets questions on her disability with a shrug. For Varsha, it's just one of those things. Varsha's made her peace with the hand fate has dealt her, and contentment lies at the heart of her dimpled smile A supportive family and an understanding husband have allowed her the freedom to live her dream, and Varsha delights in her life and appreciates all that destiny has given her. When her husband and fellow-painter brought home the works of the great artist A A Almelkar for a work assignment, Varsha found her rolemodel.Following in the same style of decorative painting, Varsha struck out on her own. Her technique is as fascinating as her paintings. The basis of each Ajantaesque painting is a bold black line, flowing fluid and unbroken through the painting. Fusing realism with the miniature style, Varsha's works are a cornucopia of colour and rich, gorgeous detail. Among her many successful experiments with the style is her latest innovation: adding the signature motifs that border nearly all Indian miniatures to a large canvas.